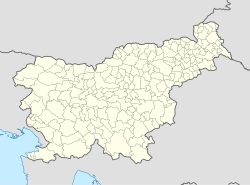 Soča (pronounced [ˈsoːtʃa], Italian: Sonzia) is a dispersed settlement in the Municipality of Bovec in northwestern Slovenia. It is located on the upper Soča River in the Goriška region, the northern part of the Slovene Littoral, on the road from Bovec up to Trenta and Vršič Pass. In the Middle Ages, the area south of the pass was ruled by the Patriarchs of Aquileia, later by the Republic of Venice, until the estates were incorporated into the Inner Austrian lands under the Habsburg emperor Maximilian I in 1509. A small church by the roadside in the village is dedicated to Saint Joseph and was built in 1718 and dedicated in 1823. In 1944 it was refurbished and painted by Tone Kralj. The refurbishment was a political statement and he included a scene of Archangel Michael fighting the Devil, in which Hitler and Mussolini are shown as enemies, fighting on the side of the Devil. He also used the Slovene national colours (red, white, and blue) in the interior and, apart from the Apostles and the Four Evangelists, used only Slavic saints in the iconography. Behind the church, the Sοča Military Cemetery is a burial ground for Austrian soldiers that died on the Isonzo front. This article about the Municipality of Bovec in Slovenia is a stub. You can help Wikipedia by expanding it. This page was last edited on 8 June 2017, at 19:49 (UTC).